Miniature Rio de Flag bowl. Click the image to open the Rio de Flag Brown gallery. Rio de Flag Brown is a type of Alameda Brown Ware found around the San Francisco Mountains in northern Arizona. Date Range: A.D. 700-1090 (per Christian Downum, Northern Arizona University). Core Color: Gray to black; brick-red to brown or buff. Temper: Predominantly opaque angular fragments (gray, tan, or black); occasional grain of quartz or feldspar. Surface Finish: Usually bumpy, compacted; sometimes polished; anvil marks often conspicuous. Surface Color: Jar exteriors brown to brownish-gray. 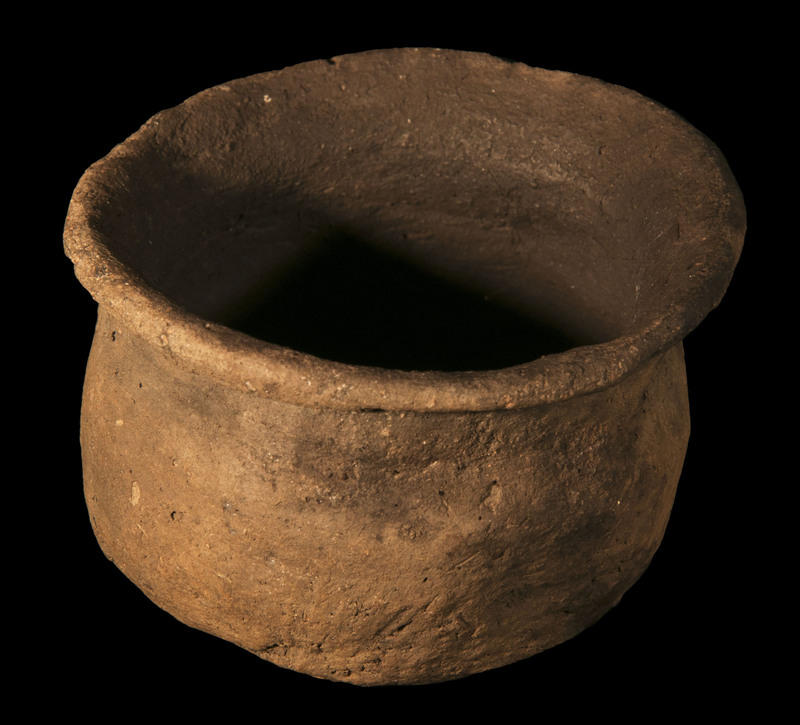 Forms: Bowls (sometimes smudged), jars predominate, pitchers rare (handle is not attached to rim), conical pipes. Vessel Thickness: 4.7 to 8.5 mm, average 6 mm (jars); 3.5 to 6 mm, average 4.7 mm (bowls). None, except on Rio de Flag Tooled (see below). Rio de Flag Smudged – Same as Rio de Flag Brown, but smudged on the interiors (bowls only). Rio de Flag Tooled – Same as Rio de Flag Brown, except that the surface is fingernail- or tool-indented. Comparisons: The temper in Woodruff Brown has abundant fine grains of quartz sand; Woodruff Brown vessels also have dull red to light brown surface colors (frequently slate gray on the interior); gritty, but fairly uniform surface finishes; and construction by coiling . The temper in Adamana Brown is mostly quartz sand, with mica-like particles conspicuous on the surface. Verde Brown has medium angular quartz temper.